As part of the Department of Campus Recreation and its mission to achieve the highest standards for its participants, we have developed our policies to ensure a safe, fair, and fun environment. The following general rules apply to all facilities and activities that are associated with the Department of Campus Recreation. Use of the Recreation Center is a privilege. Members and guests shall respect the rights of others and display acceptable and appropriate behavior while participating in the Recreation Center. Campus Recreation reserves the right to refuse access or remove any individual(s) whose behavior is inappropriate or in violation of University rules and regulations and/or the Code of Student Conduct. Your cooperation is appreciated. He/she must leave the facility immediately. He/she must meet with the designated Campus Recreation senior staff responsible for the program/facility in which the misconduct occurred. He/she shall immediately be ineligible for further access or competition in any program or facility until he/she has met with the designated senior staff. Once the Campus Recreation staff has informed a participant, member or guest of the necessity to see the appropriate person over the program/facility for misconduct, inappropriate behavior or ejection, it is that individual’s responsibility to schedule an appointment to meet with the designated senior staff member. If a sanction is imposed, it will begin after the meeting with staff. If a sanction is necessary from a specific program, the individual may still participate in other programs or have access to facilities managed by Campus Recreation. If a sanction is necessary from the Recreation Center, he/she may not participate in any programs within the Recreation Center. Any incident that involves a participant, member or guest who strikes, hits, pushes, threatens, spits at/on, kicks, verbally abuses a Campus Recreation employee, participant, member, guest, or spectator, or improperly uses his/her ID Card will result in immediate suspension from all Campus Recreation programs and facilities. Further, if deemed appropriate, information regarding the incident may be forwarded by Campus Recreation staff to the Dean of Students, University Police Department and/or any other department that the recreation center feels should be involved. Participants are responsible for reading, understanding and abiding by all rules and regulations of the Recreation Center. Not all rules are posted in immediate areas. If a staff member requests your cooperation, please adjust your behavior. If you have questions about a specific policy, please see Campus Recreation staff. Failure to comply with staff instructions and proper facility use may result in loss of facility and/or membership privileges. Campus Recreation reserves the right to render judgment and decisions on policies not specifically covered. Campus Recreation reserves the right to call the University Police Department as necessary. Participants using the Recreation Center facility and equipment assume the liability of and agree to compensate Campus Recreation for any damages other than normal wear and tear. Contact Campus Recreation staff should an accident, injury, or related incident occur. In addition, report immediately any piece of equipment that is not functioning properly to so it can be evaluated and serviced promptly. Use of informal activity spaces when not scheduled/reserved, including priority scheduling, is first-come, first-served. No organized activities except those sponsored or approved by Campus Recreation are permitted. All participants must provide valid identification to use the facilities. Please present one of the following forms of identification to the front desk of Campus Recreation facilities. EKU student ID (verifying via scanner that all fees have been paid for the current semester). 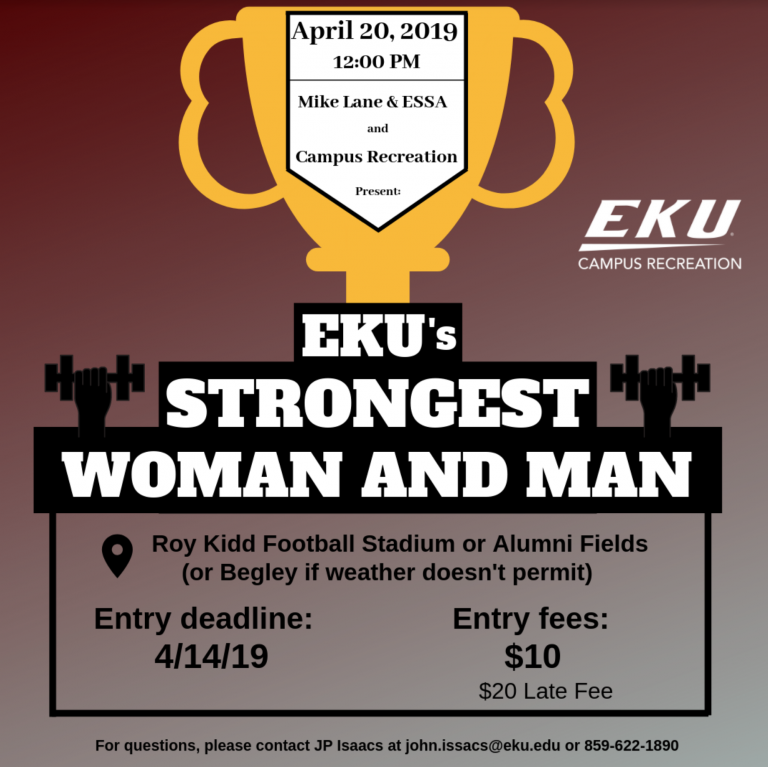 EKU Faculty/Staff ID (Campus Recreation memberships must be purchased to use the Fitness & Wellness Center and to participate in Group Exercise classes). EKU Alumni, Spouse, Donor, or Sponsored Dependent ID. Guest card or pass with or including a picture ID. If you forget you may also enter the facility with a current sponsor (current student or Faculty / Staff member) by purchasing a guest pass for $5 dollars. Any member may bring a guest for the fee of $5/per day. In order to purchase a guest pass, the guest must possess a picture ID that lists their date of birth. Guests must be at least 14 years of age and must remain with the member during the visit in all activity areas as well as depart the facility at the same time as their sponsor. A guest pass may be purchased at the Front Desk of the Fitness & Wellness Center. All guests must follow the same rules and regulations set by university participants and the university member will be responsible for their guest’s actions. The guest must leave when their sponsor also leaves. Members also have the opportunity to purchase a spectactor pass for guests interested in watching various special events and programs, such as Intramural or Club Sports or Climbing competitions. Individuals under the age of 13 are free, while anyone 14 and older will be charged the $5 guest fee. Both workout towels and shower towels are available for all paying patrons at the Front Desk including paying guest. You may also bring your own towel if you choose. Shower towels need to be checked out at the Front Desk with either an EKU ID or ID number. Once finished, towels need to be returned to the bin located next to the Front Desk. A $10 towel fee will be charged for towels not returned. Full and half lockers will be available to rent on a first-come-first-serve basis for all memberships, starting at the beginning of each Fall semester. Full lockers can be rented for $25/Semester or $50/Academic Year, while half lockers can be rented for $15/Semester or $30/Academic Year. If not renewed before the current term ends, the locker will be cleared and any contents will be placed in the Lost and Found for 30 days, before taken to Good Will. Patrons will be notified via email, as well as a reminder memo posted in their locker. The locker will then be rented to the next interested or available person on the waiting list. *Campus Recreation is not responsible for any lost, stolen or damaged items. Day use lockers are free! The day use lockers are located outside each locker room as well as the basketball courts. Patrons must check out locks through the Front Desk. Locks that are not removed by the end of the night on day use lockers will be removed, and the contents found in the locker will be placed in our Lost and Found and held for 30 days, before being taken to Good Will. All patrons have access to free personal cubbies upstairs in the weightlifting area. However, Campus Recreation is not responsobile for lost or stolen items. In order to purchase a membership to the Fitness & Wellness Center, one must be at least 14 years old and the dependent of a current member. Anyone between the ages of 14 and 17 must be accompanied by an adult while utilizing the facility in all activity areas (excluding full time registered students within the university including Model dual credit students). In addition to the normal membership rate, there will be an additional $10 Minor Membership Fee, which includes an equipment orientation and 1 Personal Training session. Wrist bands will be given to both individuals to be be worn while in the facility. While in the facility, questions can be directed towards to the Operations Manager on duty. All Recreation facilities are alcohol and tobacco free. Everyone must extinguish smoking material and dispose of smokeless tobacco prior to being within 25 feet of any facility. Individuals who appear to be under the influence of alcohol or other drugs and/or are creating harmful situations will be asked to leave, as well as those who do not follow the tobacco-free policy. In addition, a letter will be sent to the Office of Student Conduct & Community Standards concerning the violation of University rules and regulations. The University Police will be called to assist with individuals who do not cooperate. In an effort to prevent additional wear and tear on equipment and machines, all participants are encouraged to wear athletic clothing while working out or participating in activities. Athletic shoes with non-marking soles are required in all activity areas. Open toed shoes, boots, and shoes with metal buckles are prohibited. 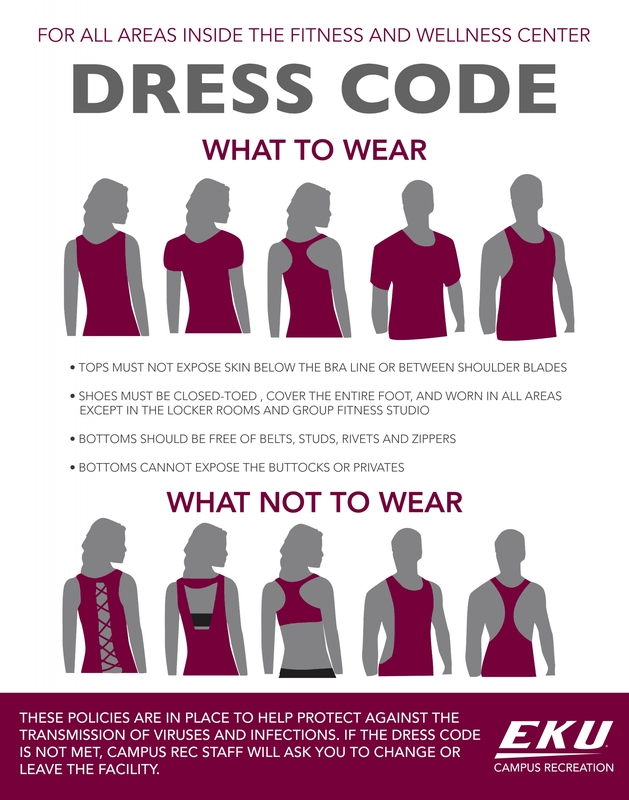 Shirts that cover the chest and back areas must be worn in all fitness areas. Participants not wearing clothing properly or found to be offensive by others will be asked to adjust as needed or asked to leave the facility. Food and beverage may be consumed in the Fitness & Wellness Center main concourse and the Champions Lounge. Open lid consumption and food is not permitted in the main gym, fitness and weight rooms, and group exercise studio. Spill proof plastic water bottles will be permitted in the multi-purpose, fitness, and weight rooms. Participants will be asked to refrain from chewing gum during activities for safety reasons and for the upkeep of the facility. Pets are prohibited from entering all Campus Recreation facilities, with the exception of service animals. Proper documentation needs to be submitted. The distribution of leaflets, brochures, and advertisements are prohibited in all Campus Recreation facilities unless first approved by the Student Life Office and then approved by Campus Recreation. To post materials in buildings, please contact the Administration Office at (859) 622-1224. 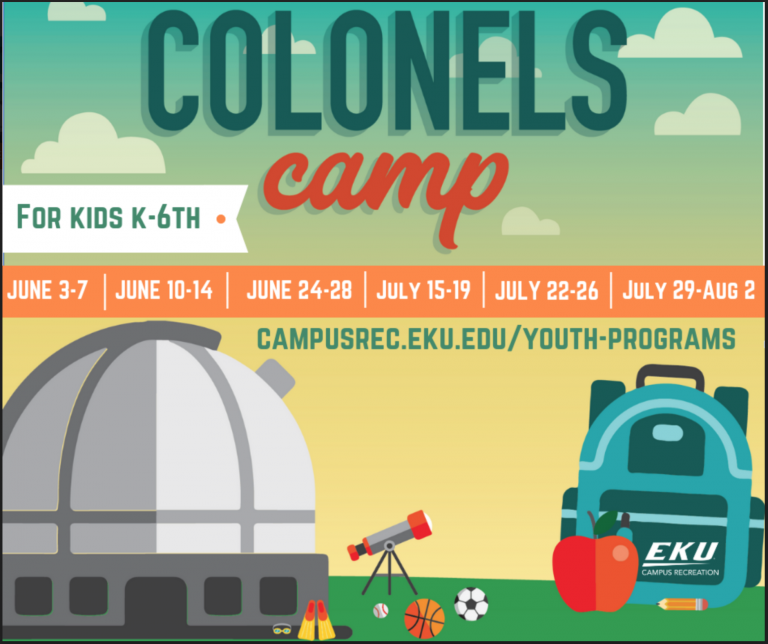 University sponsored summer camp or conference attendees will be considered a temporary member of the University Community and will be allowed to use the Fitness & Wellness Center on a fee basis. The cost to use the facility will be $5 dollars per person per day. The camp / conference attendees must be 16 years old and must bring their camp / conference ID with them. Participation in Campus Recreation facilities and activities is completely voluntary whether participating in or watching any event or activity sponsored by any group. Each individual participating or watching assumes the risk for any harm or injuries sustained. Neither Eastern Kentucky University, nor the Department of Campus Recreation can assume any responsibilities for injuries incurred through participation in facilities or activities. It is strongly advised that participants use caution and be aware of potential health risks associated with exercise, and obtain a physical from a doctor before beginning an exercise program. Should an accident, injury, or related incident occur, please contact a Campus Recreation staff member immediately. The upstairs zone is used for teaching, training and marketing of campus recreation events. However, during non-programing hours this area is open to patrons of the facility and can be used for relaxing, watching tv and collecting Health Promotion information. The track is open to patrons of the facility during normal recreation center hours unless otherwise noted. Equipment including free weights is not permitted on the track. However, specific equipment may be permitted at the discretion of the staff. The track is for runners, joggers, and walkers only. Spectators must use lower level. No standing at the rail. Food /gum are not allowed on the track. Only water bottles with sealable lids are permitted. Participants should circle the track in the direction specified. All walkers should position themselves to the inside lanes of the track and runners to the outside lanes. Faster runners should pass to the outside of slower runners. Stretching must be confined to designated stretching areas. Keeping participants safe is the number one priority for Campus Recreation employees. All Campus Recreation professional staff and student supervisors are certified in first aid, CPR, and AED and are trained to provide emergency care to participants if needed. In the event of an emergency, participants are required to report all accidents, incidents, or injuries to the nearest Campus Recreation employee so proper care can be provided. If an ambulance is necessary, the Campus Recreation staff will contact university police and follow the emergency procedures. Campus Recreation employees may not transport injured victims. In any injury situation, the injured person (when possible) and any witness will be asked questions for an accident report. Our policy on returns, refunds, and cancellations varies. Once our department initiates the process, it may take two weeks or more in order for the refund to be processed, which is beyond our departments control. The decision to grant a refund/cancellation/return in part or full is at the discretion of the staff member facilitating the program or service. Generally, if any of the below circumstances exist, a return, refund, or cancellation is granted either in full or part, within thirty days of the request. There is a billing error. Act(s) of God prevent participation or usage. There will be no refund for a patron's lack of attendance or use. EKU Campus Recreation's permanent establishment of business is in the United States.